In the private sector, which is located in the city,usually possible to lay water from the centralized network. However, in communities where there was originally the main pipeline, it is necessary to equip the autonomous system of hydraulic structures on the sites. Sometimes, however, such a need arises, and in access to the central network. That is, if in the summer you need to irrigate large areas, and water bills are too high. In such cases, once advantageous to construct a well. 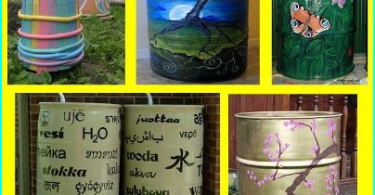 How to bring water to the house from the well or wells? You may also need additional equipment: water heaters, irrigation, irrigation systems, etc. 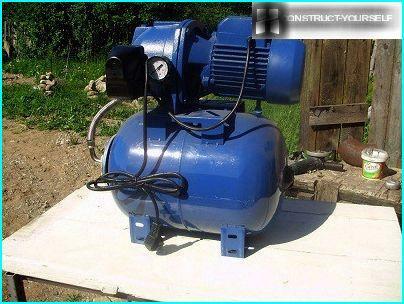 For most of the fixed water supply systemchoose submersible centrifugal pumps. They are placed in the wells and in wells. If hydraulic structure shallow (9-10 meters), you can buy equipment or surface pumping station. This makes sense if the well casing is too narrow and there are difficulties with the selection of the right diameter submersible pump. Then, in the well is lowered only the water inlet hose and that the apparatus is installed in the caisson, or utility room. Pump stations have their own advantages. 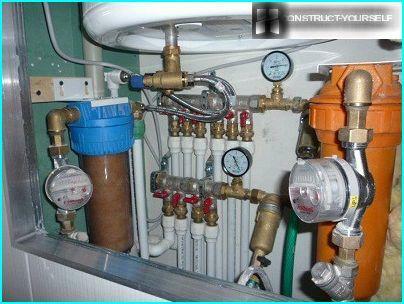 This multifunctional system - pump equipment and accumulator. Although the cost of the station is higher than a submersible pump system is ultimately cheaper because there is no need to purchase a separate hydraulic reservoir. Of the minuses pumping stations the most significant -it is a lot of noise at work and limitations on the depth with which they are able to lift water. It is important to install the equipment. 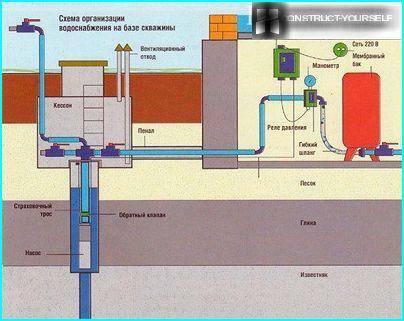 When installing the pump station to make mistakes, it can "zavozdushivatsya", which affects the stability of the water supply. There are cases where install submersible pumpit is simply impossible and you have to mount or surface pumping station. For example, if the water level in the well or wells is not sufficient to comply with the rules of deep equipment mounting. The pump must be installed so that above itWater layer was not less than 1 m, and the bottom was 6.2 m. This is necessary for a good cooling of the motor and sampling of clean water without sand and silt. Failure to observe the installation conditions will lead to rapid wear of the pump due to the pumping of contaminated water or burn out the motor windings. When choosing a submersible pump is necessary for the wellpay attention to the type of device design. If you have installed three-inch production pipe, many owners of wells buying cheap and reliable domestic pump "The Kid". The diameter of its body allows you to mount the device even in narrow tubes. However, with all the advantages of "Little Boy" - the worst choice. This type of vibrating equipment. Constant vibration motor rather quicklyIt destroys the production string. Savings at the pump can turn much more to spend on drilling new wells or replacement of the casing, that the cost and the complexity comparable to the construction of the hydraulic structure. Vibration pumps are not suitable for narrow wells due to the nature of the device and the principle of work. It is better to put the pump station. Availability gidroakkumulyatornogo tank systemwater prevents many problems with water supply to the house. It is an analogue of the water tower. Thanks to hydraulic tank pump is running with less stress. When the tank is filled, and shuts off the pump equipment includes only after the water level falls to a certain level. Hydraulic tank can be anything - from 12 to 500 andl. This ensures a supply of water to the power outage. When calculating the volume of the accumulator take into account that an average of ensuring water needs of one person should be approximately 50 liters. Every day of each tap point is taken about 20 liters. Water consumption for irrigation should be calculated separately. 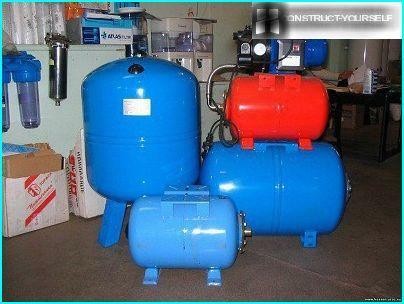 There are two types of accumulators -Membrane and storage. The former are usually low volume, equipped with a check valve and a manometer. The task of the hydraulic tank - to provide the necessary pressure in the water. Storage tanks are much larger volume. Stuffed, they can weigh up to a ton. Bulk containers are mounted in the attics, sothe design of the water supply system should provide in advance the need to strengthen building structures and to consider insulation for winter. The volume of water in the storage tank is sufficient that, when turned off the water enough electricity for at least a day. The sale is still possible to find waterpipes made of any material - steel, copper, plastic, metal and plastic. Increasingly, owners of country houses prefer HDPE pipes (polyethylene of low pressure). They are not inferior in quality metal, it does not razmerzayutsya not burst, do not rust, does not rot. Quality HDPE pipes can last up tohalf a century. The low weight, unified connection and mounting elements are relatively easy to install. 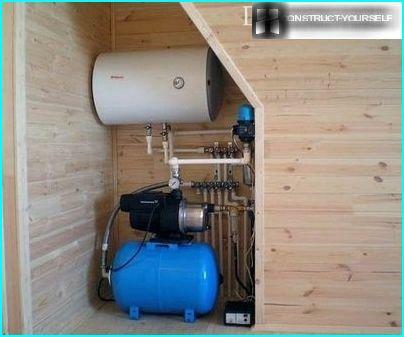 For stand-alone water supply system - is ideal, and every year more and more homeowners are choosing his name. Typically, for water buy pipes with a diameter of 25 or 32 mm. During the construction of water supply system is necessaryensure connection of the pipeline to the pump string below the level of soil freezing. The best option to connect wells - installation through pitless-adapter. If for some reason you can not connectthrough the adapter will have to build a pit or mount caisson. In any case, pipe connection should be at least the depth of 1-1.5 m. If used as a source of a well at the base is necessary to punch hole for the insertion tube. Later, when all piping work is finished, the entry is sealed. Next is about the same scheme that well,for that hole. 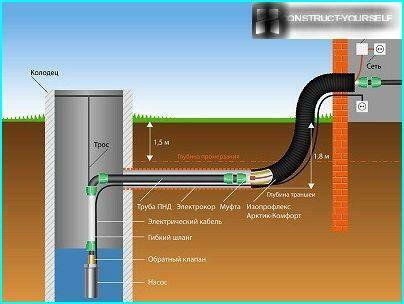 For the pipeline trench is prepared from a hydraulic structure to the walls of the house. Depth - 30-50 cm below the freezing level. It is advisable to immediately provide a bias of 0.15 m to 1 m in length. When the trench is dug, poured her bottom layer7-10 cm of sand, and then watered, tamped. On a sandy pillow lay the pipe, combined, carry out hydraulic tests at a pressure of 1.5 times the planned operation. If all goes well, the pipeline is filled layer10 cm of sand, tamped without excessive pressure so as not to break the tube. 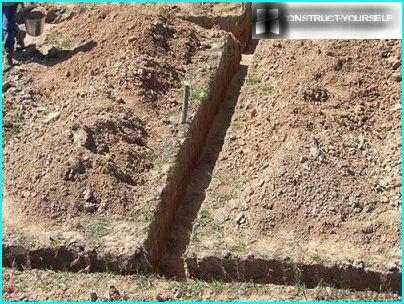 Thereafter, the trench is filled with soil. Together with pipes laid pump cable, isolated. If you want to increase it if the standard is not long enough to connect to a power source. Standard pump electrical cable - 40 m.
The pipeline lay at a depth of 60 cm andpoured 20-30-cm layer of a warming mixture - expanded clay, styrofoam chips, or coal slag. Basic requirements to the insulator - minimal hygroscopicity, strength, no seal after tamping. 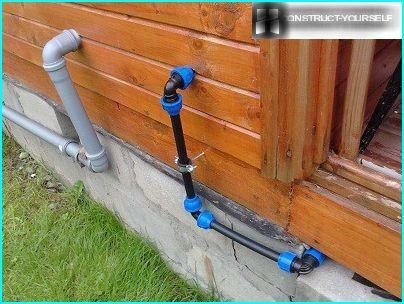 You can organize outdoor water at a shallow depth - 30 cm, if you isolate the pipe insulation and special bellows. Sometimes the pipe lay the heating cable. This is a great outlet for areas where lyutuyut hard frost in winter. 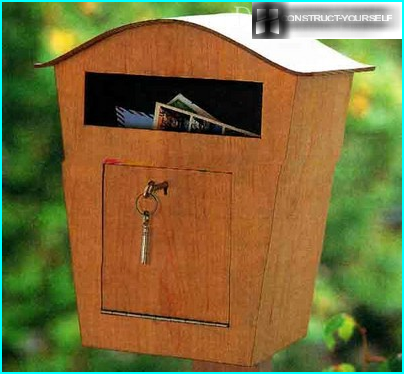 Carry out the water from the well to the house through the foundation. The conduit often freeze input is in place, even if it runs on all rules. Concrete well passes moisture, and it contributes to problems with the pipes. To avoid them, it is necessary length of pipe of greater diameter than the pipe. It will serve as a protective holsterI site. To this tube can be selected from any available material - asbestos, metal or plastic. The main thing is that the diameter was significantly greater since you need to build a water pipe with heat-insulating materials. To take water pipe 32 cm tube-holder 50 cm. Insulated pipeline, invest in a protectivestructure, and then perform padding to ensure maximum waterproofing. In the middle of the rope hammer, and from him to the edge of the foundation - clay, diluted with water to the consistency of thick cream. This is a great natural waterproofing. If you do not want to prepare their own mix, you can use the mounting foam or any suitable sealant. Commissioning of the pipeline is to be located in thefoundation, instead of under it, as after pouring can not touch the ground under construction. Similarly, administered through the foundation and sewer. Between the inlets of water supply and disposal of waste should be at least 1.5 m.
Once the water is held in a private home, you need toselect the circuit and type of internal wiring. It can be open or closed. First method assumes that all the pipes are in view. This is convenient in terms of repair and maintenance, but in terms of aesthetics is not the best option. Closed pipe-laying - a way ofplacing a floor and walls. Communication is completely masked, they are not visible under the fine finish, but this is time-consuming and costly process. If you have to repair the pipe, all the premises where necessary will have access to it, too, will require an update finishes. When the collector type wiring setCollector (comb). From it are individual tubes to each sanitary appliance. This option wiring suitable for both types of pipe-laying - open and closed. Due to the system pressure manifoldstable, but it is costly because It requires large quantities of materials. A significant advantage of this scheme is that the repair of a sanitary appliance water possibly remaining in the former regime. Tee scheme is also called serial. Plumbing devices are connected in series one after the other. The advantage of the method - its cheapness and simplicity, but the disadvantage - in pressure loss. If multiple units are operated simultaneously, the pressure is markedly reduced. When repairs at one point have to disable the entire water supply system. Mixed scheme provides for collector connection mixers and consistent - plumbing fixtures. 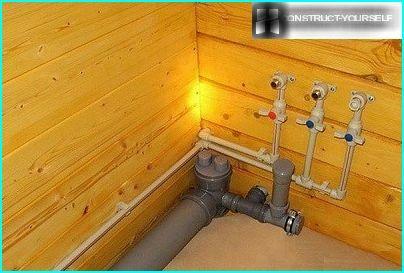 In most cases, internal plumbingselected pipe made of polymeric materials. They are easier to install than metal, plus there is no need to pay extra work welders. The only caveat: the toilet to connect to the system, it is desirable to use metal, because Polymer pipes are not always cope with the rapid changes in pressure. 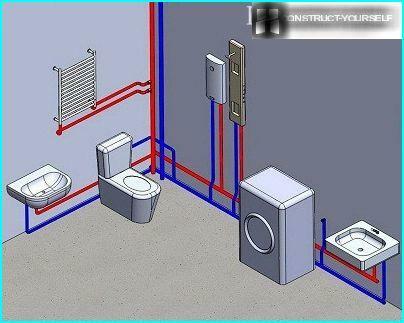 We also recommend you to read about the features of distributing pipes in the bathroom on the website "Vannapediya". To drain the system, if necessary,install a separate tap. When the internal water supply system is fully assembled, checked his work. If there is no leak, the pressure at all points of the draw is normal, the system can be commissioned. When designing a stand-alone systemwater supply should take into account the need to install filters and water treatment systems. They may differ materially Function, type of construction and connection to the water supply. To choose the right filters, you need to make the analysis of water, determine if the undesirable impurities. If the chemical and microbiological analysis of water in order, then it will be enough only to rough purification of water from sand, mud and dirt. If not - select the best equipment in consultation with experts.